I have had several pals asking me about using Dropbox lately, so I thought I would do a quick Blog post on my workflow for sending files on a Mac. At the end I will give some more info on why Dropbox is so very awesome, and why you need to sign up for a free account (Here) if you haven’t already. (Let me know if you would like to set up an account - if you refer a new user with Dropbox, both parties get an extra 500MB of storage.) 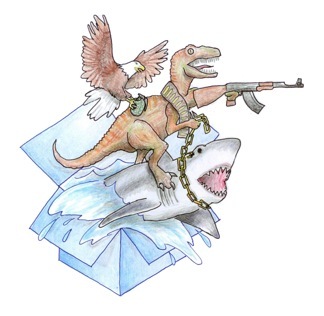 Also, I have some cool Dropbox quick facts that may surprise you. OK, So lets get started. Assuming you already have a Dropbox account setup, I am going to share with you the best way to send stuff quickly and safely over the inter-web. Most people just create a New Folder on their Dropbox account and then share that folder with other people via email invitation. While this is great for collaborative projects with several parties, it is not the best option if you just want to send some files. For this example - Let’s say I took a bunch of Pics at a family get together, and I want to get everyone hi-res versions of them. First of all, (this Is probably just a personal issue) I am a minimalist. Or at least I pretend to be, haha! Anyway, if you use Dropbox a lot, and you create and share a new folder for everything, you will quickly clutter up your Dropbox account. For example, If I took pics at several different family events I would find myself “Sharing” several different Dropbox folders, or with one big unorganized “Family” folder. Eventually, I would have a large mess on my hands. Also, I don’t want pictures from 5 years ago using up my free storage space on Dropbox. Second, and more importantly, is Safety. Lets say you are sharing a folder with someone, and they get the files they need. Did you know that they will have access to that folder until you delete it? You may have worked on the project several months ago, forgotten about the folder, and then use it for something else. Everyone that was ever sharing that folder has continued access to that folder. Or let’s say you have several different shared folders, and in a hurry - or accidentally - you drop a very sensitive file into the wrong folder. Again, everyone will have access to that in your shared folder. With the Family get together example, Let’s just say Uncle Carl and Aunt Kate aren’t married any more. You don’t want to be sending him pics of “Uncle Jeff and Aunt Kate”. hahah! Third, some files are just a pain. For example Video files. I have come to find that these are a real pain to send via Dropbox shared folders. The main thing is that Dropbox tries to play the video through your browser. If your Granny doesn’t have a really good internet connection, playback will be choppy and slow. And then she will complain to you about how her computer doesn’t work. Am I right or what?! 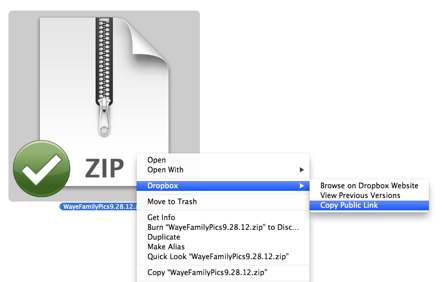 Send compressed .ZIP files to your relatives, or anyone, following these steps. They don’t even need to have a Dropbox account. Put all the files inside that you want to share with people. Pictures, Videos, Documents, etc., etc. You will see the blue spinning arrows, as the .ZIP file is uploading. When it turns into a green check you are ready to send a link. Just right click on the .Zip file and choose “Copy Public Link”. Now you can go to your email and hit paste in the memo area. You will see a URL link to that Zip file. Now you can send that email to anyone you want and they just need to click the link to download the Zip file. When they do download it, all they have to do is double click to uncompress the zip file back into a normal folder, full of all the goodies you wanted them to have. Also, on your end, organization of your Public folder is quick and easy if you name your .zip files descriptively and delete files that are old. Is DropBox King of the Cloud? This is just one scenario, but I have found this process is great pretty much anytime I need to send large files quickly and easily. I worked in the Printing industry for years and have had to deal with the frustration of trying to send and receive large files. Logging onto FTP sites, passwords, file size limitations, etc, etc, all made the process a major headache. The need for Apps like DropBox is great and will only continue to grow. That being said, since I have been using DropBox other file storage and sharing Apps have been popping up like weeds. Some of them are startups like DropBox, but others are from companies you may have already heard of Google, Apple, or Microsoft. hahah! So yeah, the need for sending files through clouds is an ever changing market that has really just begun. I have very limited use with the others, so I can’t really make any suggestions about these apps. If you do a quick Google search like “DropBox alternatives”, you will find an abundance of comparisons between the major Apps. Some of the more popular ones are Google Drive, Microsoft SkyDrive, Apple iCloud, Sugar Sync. Each offer similar services, but you may find one that fits your exact needs. While I may change my mind in the future, the simplicity of Dropbox makes it an easy choice. The scenario I mentioned above cannot get any simpler, and it’s easy for computer beginners, like “Granny”, to just get the stuff they want. Dropbox has more than 50 million users. People save one billion files to Dropbox every 48 hours. Dropbox is installed on 250 million different devices. Dropbox is offered in five languages: English, Spanish, French, German, and Japanese. Dropbox has paying customers in 175 countries. More than half of Dropbox users are from outside the U.S.
People in over two million businesses are using Dropbox.